The Rainbird – Cruising Seattle's Waterways in Style and Comfort! C limb aboard our classic yacht and take in Seattle’s waterfront views of beautiful Lake Union and adjoining waterways. You’ll have the best seat in the house while cruising aboard the classic 42′ Grand Banks yacht, the Rainbird. The Rainbird is meticulously maintained and cared for, and shows it throughout. The vessel offers comfort throughout with comfortable seating in the deck area, a fly bridge deck gives you a second floor viewing area for entertaining and taking in the incredible views of Seattle’s awesome sunsets, and a lounge below-deck to get out of the wind, if desired, with refrigerator, stove, oven and microwave. There are also two staterooms, each with its own ‘head’ and shower. The master stateroom has a center island queen bed with an office desk. The forward stateroom offers double twin-size beds in a v-berth layout. The Rainbird is centrally located, close to downtown Seattle, Lake Union, U of W, and Lake Washington. 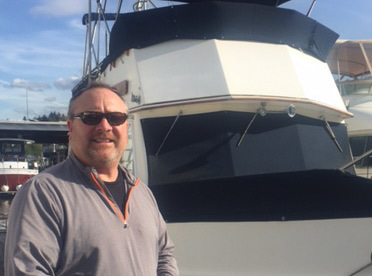 Kelley has been on and off the water for most of his life—his four children grew up on the water, and he fished out of Dutch Harbor, Alaska, before he retired back to the lower 48*. Kelley purchased the Rainbird in 2017 and for him it has been a dream come true. Now he’s looking forward to sharing this dream with you!